While working for the Blake Archive over the summer, I found myself drawn into two different worlds, both based in language and presentation, beset with problems of transcription and clarity, and cohering around the sublime mind of William Blake. First, I discovered that Blake’s poem “The Tyger” is delivered through the mouth of a serial killer in The Mentalist, a crime drama that aired from 2008-2015 when I found a used DVD boxset in Baltimore. In the final episode of the second season, the protagonist and crime-solving consultant Patrick Jane narrowly escapes his own murder at the hands of two thugs only to discover that the masked man who overtakes his abductors is none other than his nemesis, the serial killer Red John who murdered his wife and child. It turns out that Red John is a member of “the Blake Association” and William Blake asserts an ambient, somewhat haunting literary presence throughout the show. Of course, these four lines are among the most published and anthologized in English. And, yet, they mystify me less than the plainer, more ritualistic, social and transactional language with which Blake composes his Westminster letters, which are forthcoming in the Archive. My sense of Blake moves from one of slightly terrified amusement at his pop culture invocation to one of curiosity for the human behind the immortal words. Popular entertainment often delivers pre-packaged interpretations, but the letters provide a network of daily experiences that provide context and information about the period beyond Blake’s work itself. As you can see, the paper is torn and the words are unclear. Working in XML often makes me feel clueless, but the logic of choice tags is starting to cohere. 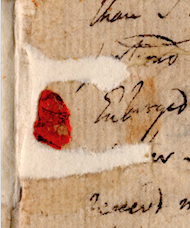 Transcribing Blake’s letters into XML at least, for me, reinforces the incidental nature of letter writing, the process of analyzing letters, circulating them, and then—hundreds of years later—trying to record the state of the letters themselves in a digital language. It seems, at times, like the practical, physical markers of Blake’s efforts are more sublime than whatever darkness inspired the glamorous romance of Blake on TV in the early 2000s.